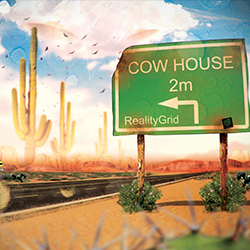 Cow House is RealityGrids 3rd album, written and composed by psychedelic pioneer Alex Diplock. Alex has a long established career in the psychedelic underground music scene also performing globally as E.V.P, pushing the boundaries of what is possible and conjuring up new techniques of sound design, audio manipulation and infectious groove to add some funking swing into farm yards and dance floors worldwide. His expertise and experience has put him at the forefront of this exciting music genre,and his influence on the scene continues to grow with the support of Wildthings Records fully behind him. His appetite for music production is out of control and his quest for sonic knowledge shines through here in his first self mastered album release, featuring extensive sound design and 3d stereo audio processing techniques and also ‘Kyma x’ the legendary sound design platform. Enjoy in muddy fields or pastures green or anywhere you can stomp your hooves! Enjoy!